The folks and the critters here at the farm have all been busy, busy, busy! Farmer David has been cleaning up fence rows, fields and the barn, the alpacas have been busily munching down their fields, the chickens have been on bug patrol, Ross, the barn kitty, is keeping varmints away and Mason, the Wonder Dog, is in charge of security. Momma Christine has been experimenting with handmade soaps, organizing the medical supplies and heading up the media. We are a little crew, but we do mighty things! All of this is happening so we can welcome folks to our little slice of heaven this weekend for National Alpaca Farm Days, and we are in the final countdown (do you hear the music?? Is it stuck in your brain yet? You can thank me for that this weekend). We will open our gates and our barn doors to the public, no appointment necessary, on Saturday, Sept 24th from 10 am to 6 pm and again on Sunday, Sept. 25th from Noon until 5 pm. We will have yarn from our animals on hand, raw fiber from this years clip, and be taking pre orders on alpaca socks, felted soaps, scarves, gloves, etc for the Christmas holidays. We will be giving tours through the fields at the top of every hour, and if you would like to bring a chair and knitting, crochet, weaving, spinning gear, reading, etc we will have a spot for you to sit with the herd while you craft and relax. We look forward to seeing our old friends and meeting our online and new friends. See you this weekend! He’s got a chicken to ride! Welcome to our slice of heaven! Hello, friends! We welcome you to our blog! This is a new adventure for us, so I’m sure there will be some bumps in the road. Bear with us, and together we can work it out. In the meantime, let us know what you would like to see on the blog. Do you want to know more about alpacas in general? We can do that! What do you do with them? We can do that, too! Learn about our herd? Got it covered. Want to schedule a time to visit with the crew? Done! We want you to feel like the blog is an interactive place where you can feel free to comment and add suggestions. 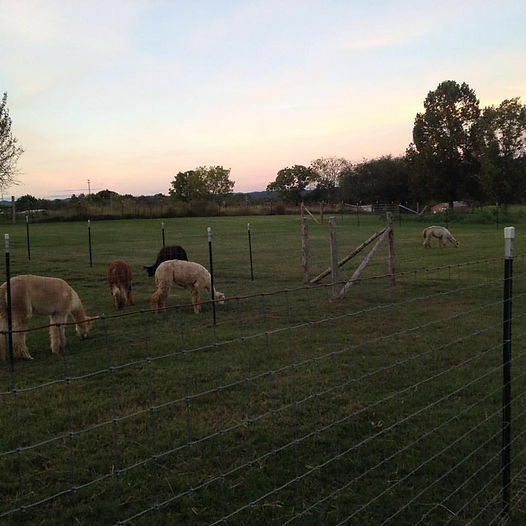 A quick preview into some of the topics we will be covering soon: What’s an Alpaca?, Alpaca 101, Fiber & Fleece. Thank you for sharing a part of your day with us! We truly appreciate it! If you found something you liked, please pass our site along and give us a like or two on social media!